presents " LOST RESTAURANTS OF NEW ORLEANS "
From Café de Réfugiés, the city's first eatery that later became Antoine's, to Toney's Spaghetti House, Houlihan's, and Bali Hai, this guide recalls restaurants from New Orleans' past. Period photographs provide a glimpse into the history of New Orleans' famous and culturally diverse culinary scene. Recipes offer the reader a chance to try the dishes once served. 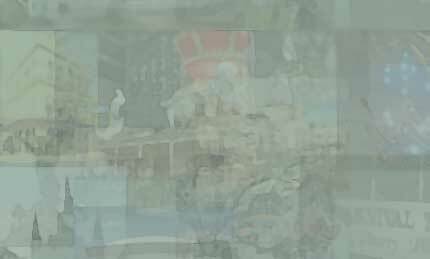 This pictorial treasure trove of information offers the history behind Gluck’s, the French Quarter restaurant where Tennessee Williams worked as a waiter; La Louisiane, the fancy establishment famous for Diamond Jim’s fettuccine alfredo; and Kolb’s, one of the only restaurants specializing in German cuisine. From bistros, cafes, and casual diners to hotel restaurants, this pictorial collection celebrates some of the most memorable former eateries in New Orleans. 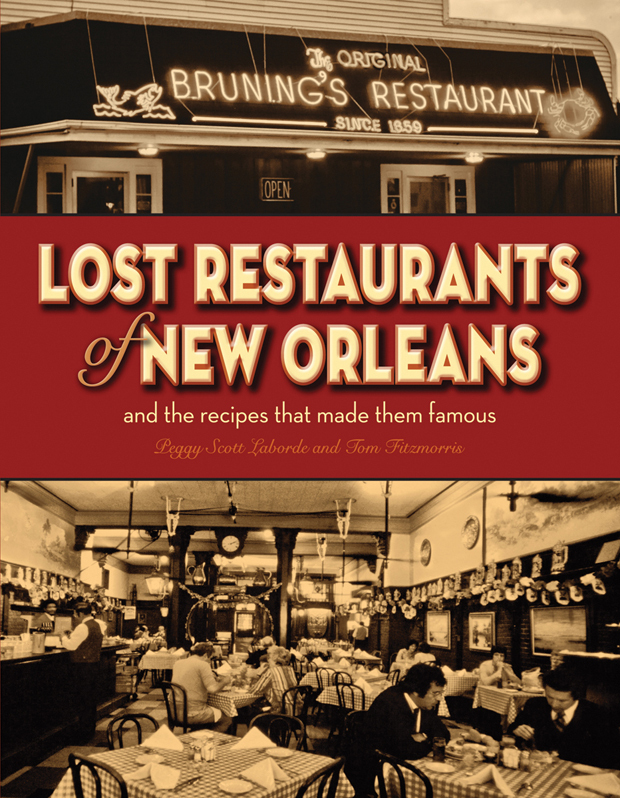 Authors Peggy Scott Laborde and Tom Fitzmorris provide a historical overview of each place and reminisce about what made it special, while describing a number of the dishes once served. More than forty recipes from various cuisines fill the pages of this culinary adventure through New Orleans' past. The book recalls the vast pancake menu and kitschy cowboy décor from Buck Forty-Nine Pancake and Steak House, the trout LaFreniere made by La Louisiane's Diamond Jim Moran, the Caribbean Room's romantic ambience and signature dessert-the mile-high ice cream pie-and the flaming cocktails and shrimp on skewers from Bali Ha'i at the Beach, along with the traits of many more establishments. By including such recipes as Lakeview Seafood's Oyster Boat, T. Pittari's Crab Bisque, and Bistro Steak Room's Eggs Bitoun throughout Lost Restaurants of New Orleans, the authors invite the reader to sample the menu items. In addition to anecdotes from the authors, such notable New Orleanians as the Batt brothers and JoAnn Clevenger, the owner of Upperline Restaurant, share their personal experiences. Period photographs provide a glimpse into this city's rich culinary past. Such recipes as Shrimp Toast from Dragon’s Garden, Stuffed Macaroni from Toney’s Pizza & Spaghetti House, Maylie’s Turtle Soup, and Christian’s Oyster Roland fill the pages of Lost Restaurants of New Orleans. Recollections from well known locals and photographs allow the reader to visualize New Orleans’ famous and old-time culinary scene. Peggy Scott Laborde is the producer and host of Steppin’ Out, which airs on WYES-TV in New Orleans. Her professional accomplishments have earned her awards from the Press Club of New Orleans, the Public Relations Society of America, and the American Women in Radio and Television. She has garnered praise for her extensive efforts in conserving the arts and history of New Orleans. Laborde is also the author of Pelican’s Canal Street: New Orleans’ Great Wide Way and Christmas in New Orleans. She lives in New Orleans. "Steppin' Out' is produced and hosted by Peggy Scott Laborde.